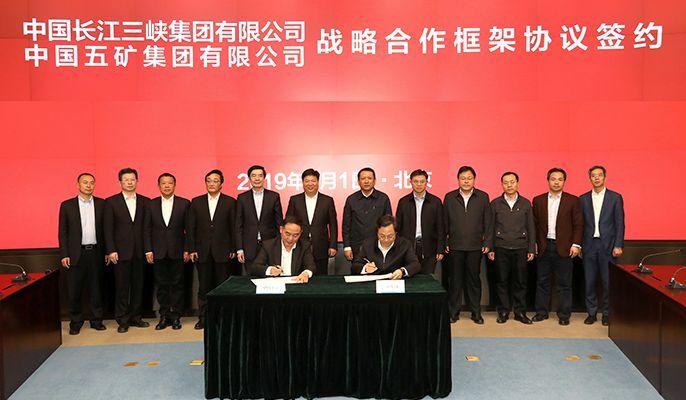 On March 1, the signing ceremony of the strategic cooperation framework agreement of China Minmetals and China Three Gorges Corporation (hereinafter referred to as "CTG") was held in Beijing. Guo Wenqing, General Manager of China Minmetals, Deputy Secretary of the Leading Party Group and Chairman of MCC, and Wang Lin, Deputy Secretary of the Leading Party Group and General Manager of CTG and Leader of the Protection Group of Yangtze River, jointly attended the signing ceremony and witnessed the signing of both parties. Before the signing ceremony, Guo Wenqing and Wang Lin held the working talks and conducted the deep communication in the all-dimensional and multi-field cooperation. Guo Wenqing showed his gratitude to Wang Lin for the warm reception and the long-term support of China Minmetals by CTG, and introduced the development history and condition after the strategic recombination in the two world top 500 enterprises: China Minmetals and MCC. Guo Wenqing pointed out that China Minmetals is the largest domestic metallic ore enterprise group with the highest internationalization degree, and is also the largest and strongest metallurgical construction operation service provider worldwide. In 2018, guided by the strategic objective of "Doubling in Three Steps", China Minmetals' operating income exceeded RMB 500 billion, and the profit created another historical record. At present, the total assets it managed reach RMB 1.86 trillion. China Minmetals is now building up its pillar business system comprised of metal mining, metallurgical construction, trade and logistics, finance and real estate. In terms of metal mining, China Minmetals has developed and operated world-class mines such as Las Bambas copper mine, the Dugald River zinc mine and Ramu nickel mine in Papua New Guinea. On the aspect of the metallurgical construction, it accounts for 90% of the domestic metallurgical construction market and 60% of the global metallurgical construction market. In terms of trade and logistics, it has a global trade circulation network covering more than 60 countries and regions in the world. And in terms of finance and real estate, it has full financial licenses. Among the 16 central enterprises of real estate as their mainstay business identified by the State-owned Assets Supervision and Administration Commission, China Minmetals takes up two of them. In addition, China Minmetals ranks in the forefront of the central enterprises in terms of science and technology innovation, and owns 37 national key laboratories and scientific and technological platforms. Guo Wenqing stressed that CTG, with a high political position and a high strategic horizon, has made an important contribution to China's economic and social development through the development and utilization of clean energy such as hydropower and wind power. In recent years, as a central enterprise, it has played a front-runner role in the protection of Yangtze River and shouldered the responsibilities for assisting the pollution prevention and control. China Minmetals has advanced technology and rich experience in sewage treatment, waste incineration, soil restoration, environmental treatment, infrastructure construction and other fields. 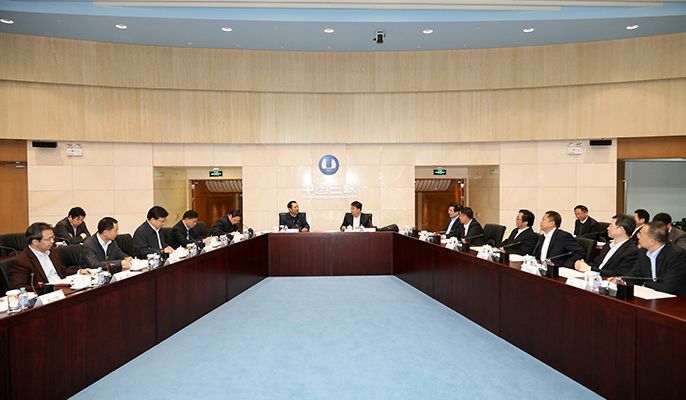 They hoped that the two parties will take the opportunity of signing to comprehensively strengthen the communication and cooperation, deepen the cooperation level, expand the cooperation area, and jointly invest and build more profitable projects, thus promoting the advancement of major national strategies together. Wang Lin welcomed the visit of Guo Wenqing, and expressed his appreciation for the achievements of China Minmetals and MCC after the strategic recombination, and introduced the development history, main business and mission of CTG. Wang Lin pointed out that CTG has become the world's largest hydropower development and operation enterprise and China's largest clean energy group. It is accelerating the construction of a world-class clean energy group with strong innovation and global competitiveness. In 2017, the CPCCC and the State Council had given CTG a new mission and new task to play a key role in the protection of Yangtze River. In particular, the affectionate remarks of General Secretary Xi Jinping while visiting the Three Gorges Hydropower Station on April 24, 2018 have simulated the staff to strive for higher targets with a great mission and a great responsibility. Wang Lin stressed that the transformation of China Minmetals and MCC in recent years has been active and successful, in particular, the successful experience of China Minmetals in "going global" is worthy of the study and reference of CTG. CTG looks forward to the all-round exchanges and cooperation with China Minmetals. 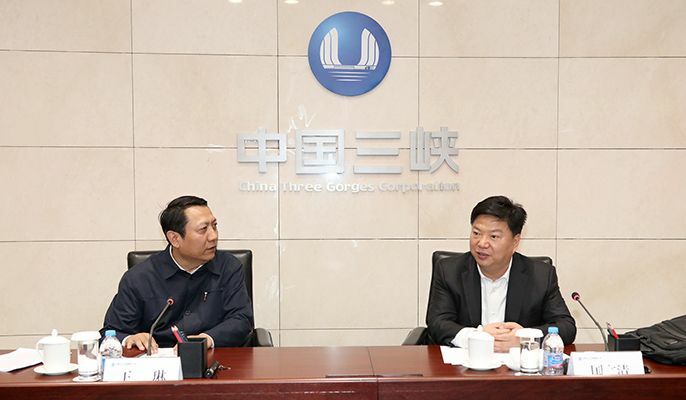 Taking this agreement as the starting point of the new cooperation, CTG will further promote the "protection of Yangtze River", expand the multi-field business cooperation, realizing the mutual benefit and win-win development. During the visit, Guo Wenqing and the delegation also watched CTG's comprehensive demonstration system of production and operation. At the signing ceremony, under the joint testimony of Guo Wenqing, Wang Lin and other leaders, Zhang Zhaoxiang, Vice General Manager and a member of the Leading Party Group of China Minmetals, General Manager and Secretary of CPC of MCC and Sun Zhiyu, a member of the Leading Party Group and Vice General Manager of CTG, and deputy leader of the Protection Group of Yangtze River signed the strategic cooperation framework agreement on behalf of both parties. 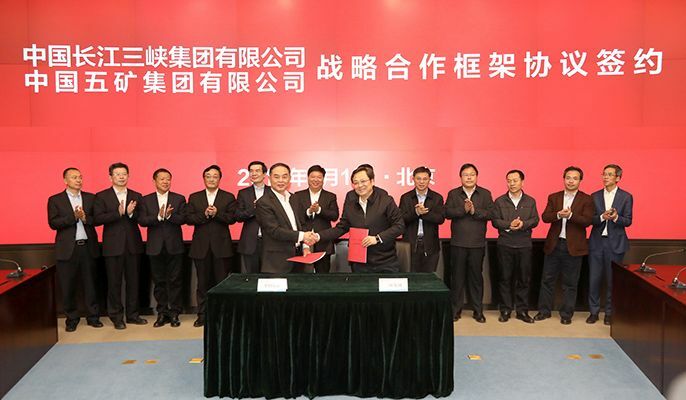 Liu Caiming, Vice General Manager, Party Group Member and Chief Accountant of China Minmetals, attended and witnessed the signing. Relevant personnel of CTG – Xu Junxin, Wu Jingkai, Wang Dianchang, Zhao Feng, Cheng Zhiming, Yang Hongbin and Zhang Chuanhong, and relevant personnel of the relevant departments of China Minmetals, and relevant personnel of MCC, Minmetals Finance and Exploration Company – Zhang Mengxing, Wang Jionghui, Yin Sisong, Xue Fei, Tian Guixiang, Yang Kui and Liu Guowei participated in the above activity.